Well, I guess I’m going to really do this thing. I don’t know how often I’ll be posting, or if it will be any good, or if anyone will even read what I write. I’m still learning my way around the whole blog “thing”, so be patient with me! It’s hard to believe that I have been doing this for 8 years – WOW!!!! When you start up a blog, one of the first things that you have to do is come up with a name for it. You want it to be catchy and personalized, without sounding too self-important. You also want to hint to people what kind of adventure they will be going on if they decide to read your blog. My blog’s name is a play on the pronunciation of my last name, Koch. “Koch” is the German word for “cook”. My husband’s family pronounces their last name “Koch” to rhyme with “cook”. The inspiration for the title of the blog was the “Cook’s tour” from travelling’s heyday. I substituted “Koch” for “Cook”, and vóila, “Koch’s Tour“, the perfect name for my blog! A long or complicated journey; an indirect route. The detour meant that we had to go on a twenty-mile Cook’s tour to get home. In 1841, British missionary Thomas Cook convinced a British railway to run a special train to a temperance meeting, then proceeded to find passengers for the trip, an event regarded as the beginning of organized tourism. 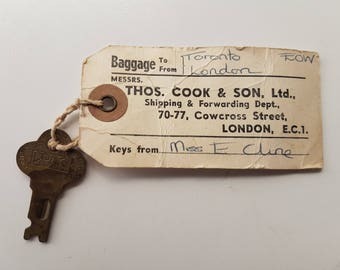 Within a few years, Cook was setting up excursions on a regular basis, and by the century’s end, the Thomas Cook & Son travel agency was orchestrating travel around the world. The agency’s tours were famously well-organized, but they were also known for herding travelers hurriedly from location to location. A Cook’s tourist might see an impressive array of famous sites, but often only in superficial glimpses. Over time, English speakers started using “Cook’s tour” for any hurried tour. So, there you have it – my blog’s “origin story”. Thank you so much for “taking the long road” with me through my world! This entry was posted in Annual Posts, Family, Just Because and tagged Blogiversary, Cook's Tours, History, Origin story, Since 2011, Thomas Cook. Bookmark the permalink. 2 Responses to It’s My Blogiversary!